In this tutorial, I’m going to pull everything together. After this we will be very close to being finished. I’ll create the menu bar for the theme. Then I finish styling the front blog page. I show you how to make sure your images always align properly. To finish everything else I style the final pages I’ll make in the next tutorial. We are almost done. 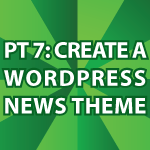 If you missed part 1 of this tutorial it is here WordPress News Theme. All of the code follows the video. Use it however you’d like under the GNU license.